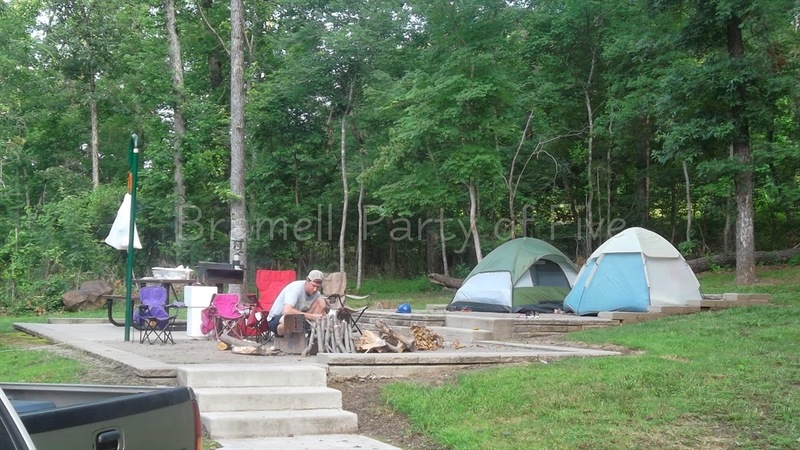 Bramell, Party of Five: The Great Outdoors & A Giveaway! #Sponsored post. See information below. Well, the Party of Five is fresh off our first family camping trip. We spent last weekend camping at Lake Fort Smith State Park, which is about 30 miles from home. It was our first trip to the park, and we were in awe of the beauty and all the fun things to do there. We even got to take Fergie with us! We camped, we walked and we played. But, more than anything, we ATE! I guess that's just part of the scene. Keep reading to see some of the yummies we cooked and how you can WIN something delicious from me. Our campsite, which was the farthest one away from the bathroom (of course). 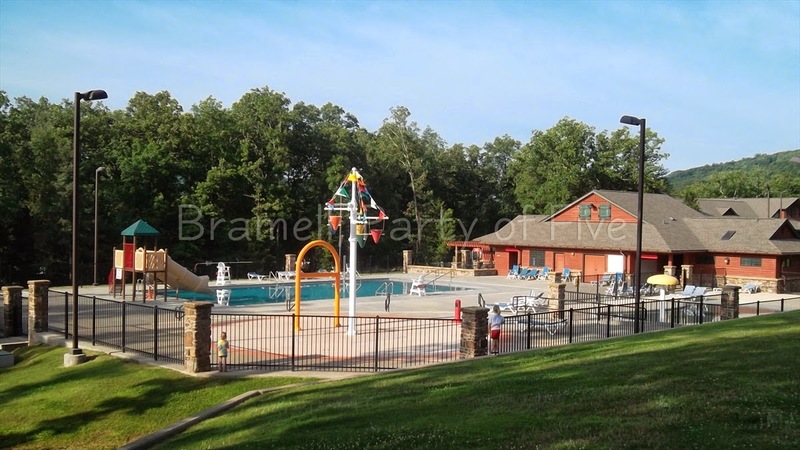 The fantastic swimming pool, complete with water slides and splash pad. We spent some of the hot afternoon there. 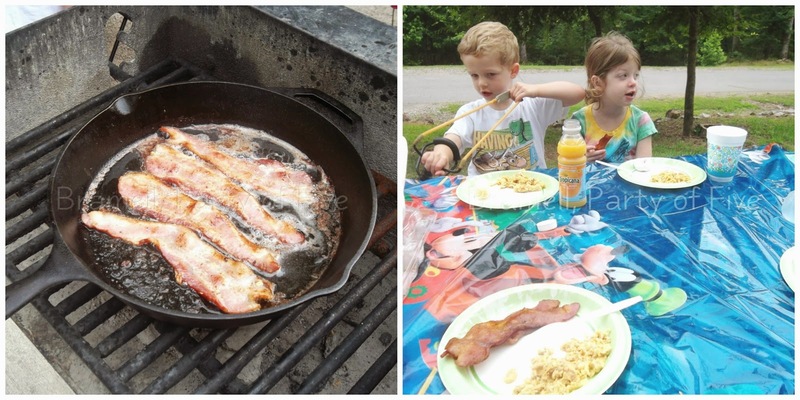 Breakfast in the great outdoors, courtesy of Dad and Petit Jean Smoked Bacon! What? Doesn't everyone need a slingshot at breakfast? Here we are roasting our Petit Jean Grillers over the campfire, some of us more fashionably than others. Now, let me tell you a secret. I am not a hot dog person; in fact, I usually pass on the dogs. However, I will throw down some PJ Grillers! They are the best (and only) hot dogs that I will eat. Do you want to try some for FREE? Leave me a comment in this post and tell me about your favorite place to go camping. Are you a tent or RV kind of person? I'll give one person four packages of PJ Grillers FREE to try out. Edit: Please leave me your email address with your comment, so I can reach you if you win. Deadline to enter giveaway is Tuesday, July 1st at 5pm Central. 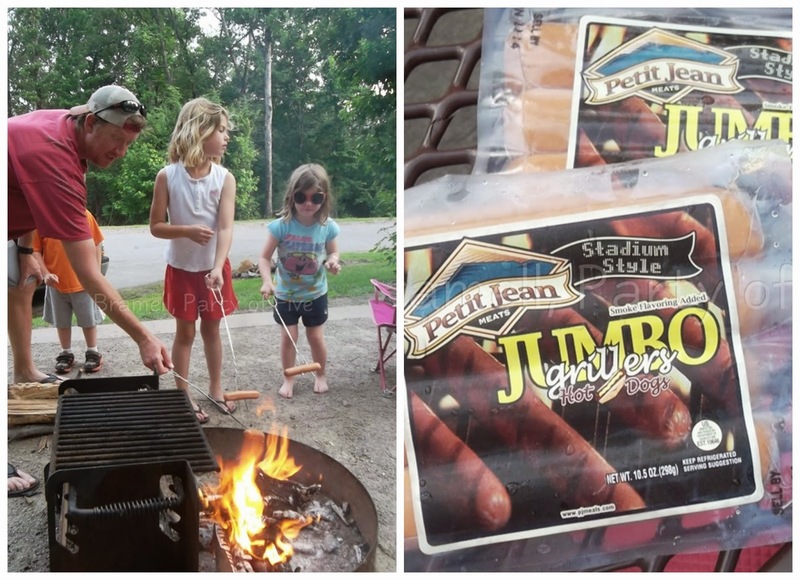 And, by the way, July is National Hot Dog Month....so you can celebrate, courtesy of Petit Jean Meats and ME! Disclaimer: I am a member of the Petit Jean Meats Blue Diamond Club. Through this affiliation, I get to try out products, and give my opinions on new products and branding for the company. My opinions are my own and honest reflections of how I feel. I was given some PJ Grillers for this giveaway, in exchange for promotion on this blog. I love hot dogs. I do not like camping. Unless, by camping, you mean staying at the Wyndham Suites where the girls gets their own rooms and I get to sleep in, then I LOVE camping! I love to go camping! We have several spots that we like to go to. Washington Cove in Copan Ok and Osage Hills State Park between Bartlesville and Pawhuska Ok.
We loved Greers Ferry Lake on that trip, and Turner Bend on the Buffalo is a favorite too! Definitely tents - but showers and running water on site is IMPERATIVE. The girls love camping! We usually camp in MO at Camp Tilden because we usually have family to help out! We almost always camp I, our huge tent! We are thinking of camping at Beaver lake next time though! I just wrote a post, but it disappeared??? We've never been camping as a family, but that pool is making me want to try it. The girls would probably prefer tent camping, but I like RV camping…..I prefer having the bathroom close by. If their good enough for you. Their good enough for me! Do they come with a grill man? Love camping, haven't been since the kid was born. Love going to the Buffalo!